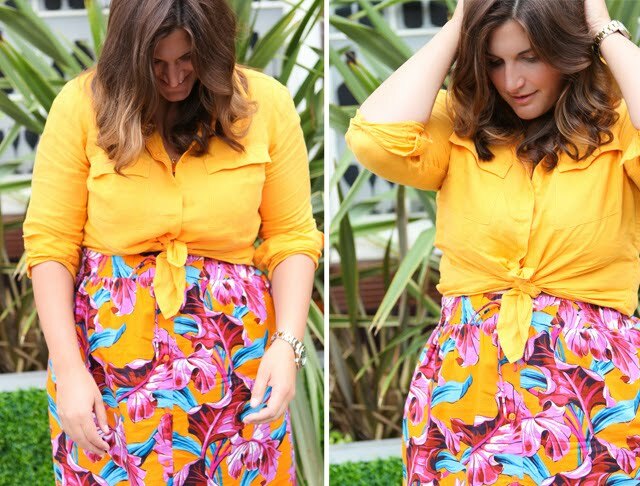 Style Update: Tropical Skirts for all! I do sometimes wonder what you guys would think if I woke up one morning and decided to wear all black, all the time. I saw a lady, walking in Notting Hill today, that was head to toe in black. She wore a black tank, black skinny jeans and a black cardigan. She looked chic as hell and I, all the sudden, had an urge to replicate the look entirely. Then, I looked down and saw a flash of colour from my skirt and instantly shook it off, for the moment. Anything could happen. But that's why fashion is a force of nature. From day to day you can recreate who you are and your message to the world. Why not play with that and experiment greatly, whether it's with colour or the lack thereof?